MCCLAIN (52) — K.Penwell 0 (1) 2-2 5, B.Badgley 0 (0) 2-2 2, E.Cockerill 4 (1) 2-4 13, G.Banks 2 (0) 0-0 4, D.Carter 3 (0) 4-4 10, D.Mischal 5 (1) 2-5 15, T.Newkirk 0 (1) 0-0 3. TOTALS: 14 (4) 12-17 52. HILLSBORO (34) — R.Scott 2 (5) 0-0 19, E.Watson 1 (0) 3-6 5, B.Miller 4 (0) 0-0 8, R.Bloomfield 0 (0) 2-2 2. TOTALS: 7 (5) 5-8 34. GREENFIELD — The resurgence of the McClain Tigers basketball program took another step forward on Saturday night, as they not only defended their home court in front of a jam-packed crowd, but they also gained a season sweep against rival Hillsboro, winning by a 52-34 score en route to gaining their 13th victory of the season. McClain’s win over the Indians was the second time this season they gained the Frontier Athletic Conference win over their rival, as the previous game against Hillsboro saw the Tigers win, 55-41 at Hillsboro. This season has also seen the Tigers go undefeated against Highland County counterparts, as they also have wins against Fairfield (73-55) on Jan. 5 and Lynchburg-Clay (66-43) on Dec. 4. Also with the win, the Tigers are now 13-7 overall with an FAC mark of 5-4, while the Indians are 8-13 overall with an FAC record of 3-7. “This was a rare senior night,” McClain head coach Joe B. Stewart said. “I always try to soften the edges of it by saying this isn’t the end of anything, and in our case it is because we are back here next Saturday with a big one against Washington Court House and it is a game we really want. Tonight, it took us a little bit to find ourselves, and I thought we had a bit more of a spring in our step after halftime. As for the Saturday night showdown at McClain Gym, it was the Indians who struck first in the most closely contested quarter for any of the four played, with the Indians sinking a 3-pointer by Ryan Scott. Scott scored all 11 points for the Indians in the first quarter, as he made three 3-pointers in the first frame and finished with 19 points for the game, making five 3-pointers and two two-point field goals. Those points were followed by McClain scoring the next four off a put-back bucket by Ethan Cockerill and a put-back basket in the paint by Devin Carter, as Cockerill finished with 13 points and Carter had 10 points for the game. HHS came back with five straight points by Scott, only to see Cockerill score two points in transition following a steal and assist by Kobe Penwell. Scott scored his 11th point of the quarter with a 3-pointer — his third of the quarter for the Indians — to push the HHS lead to five points at 11-6 with 45 seconds left in the frame. The scoring wasn’t finished, though, as Dalton Mischal sank a 3-pointer of his own with 24 seconds on the clock to make it an 11-9 deficit. The Tigers were led in scoring by Mischal with 15 points in the FAC win. McClain tied the score to start the second frame when Cockerill made both free-throw attempts within the first minute of the quarter. Scott scored his 14th point of the game for the Indians with his fourth 3-pointer of the first half with 6:40 on the clock, this time with the assist from Mason Swayne. The Tigers had an answer and his name was Mischal, with the junior taking away the basketball with a steal and driving to the hoop for two points to get the Tigers back to within one point of the visitors. After Scott took a charge, it was Brad Miller’s turn to contribute to the Indians’ scoring, and after a Tigers timeout, MHS made it a one-point deficit once again with a jumper from Cockerill. With the second frame nearing a close, Penwell sank a 3-pointer at the top of the key, and after the ball swished through the hoop, it was McClain holding a two-point lead at 18-16, their first lead since the first quarter. MHS ended the first half with a rebound and power move to the hoop with Mischal scoring two points while being fouled, leading to a 20-16 halftime advantage for the host Tigers. The Tigers’ third frame really set the tone for the FAC match as they won the quarter 15-5 with a mix of offense that saw three players score points, but even more so, their defense played at a high level coming out of the locker room. 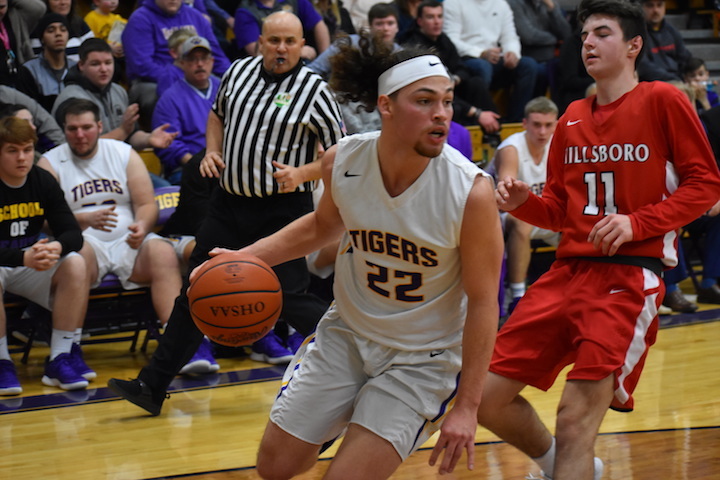 The third frame included the Tigers scoring the first three points of the frame with help from Mischal and Carter, followed by two free throws by Hillsboro’s Reece Bloomfield. McClain then scored the next seven points off layups by Mischal and Cockerill, and then after a Tigers timeout, another three points by Cockerill off a 3-pointer with 3:47 left on the clock for a 30-18 Tigers lead. For the rest of the frame, the Indians and Tigers added to their scoring totals with MHS leading the Indians, 35-21. “The difference in the game was in the first half, we made shots, and the second half we didn’t make anything, and that is a credit to their pressure,” Hillsboro head coach Bruce Miles said. “In the first half, we did a good job of executing the things we’ve been working on, and Ryan Scott shot the ball extremely well for us. The key for us tonight was keeping them (MHS) off the glass and handling the pressure, and for spots in the first half I thought we did that, until the very end when we gave up a basket and an and one to Mischal. He was trouble for us all game, and he’s such a physical kid and jumped well. We just did a poor job of keeping them off the glass. The fourth frame saw the Tigers win the quarter, 17-13 with the game in hand for the final eight minutes. McClain had scoring from Penwell, Bryson Badgley, Cockerill, Garrison Banks, Carter and a big-time 3-pointer from Trevor Newkirk. Hillsboro’s fourth-frame scoring included points by Scott, Ethan Watson and Miller, as Miller was the Indians’ second-leading scorer with eight points. Watson finished the game with five points, and Bloomfield rounded out the Indians’ final scoring with two points. Coach Miles spoke about Scott’s game on Saturday night. “Ryan is a gym rat, and we knew that after last year,” he said. “Ryan is a tough kid, and he loves the game and is always working on his game. He is going to continue to get better and better, and he is such a great kid and comes from a great family. We have to try to get him more shots in the second half. The game ended with the Indians finishing 5-of-8 from the free-throw line with a total of seven two-point baskets and five 3-pointers. On the other side, the Tigers made 14 two-point field goals, four 3-pointers and were 12-of-17 in their free-throw shooting. In the turnover category, MHS committed 11 and the Indians had 23 for the game. The game also celebrated the seniors of both teams, as it was Senior Night at McClain. The Tigers honored Kobe Penwell, Ethan Cockerill, Devin Carter, Patrick Fout, Trevor Newkirk, Theo Dehecq, Reece Schluep, Zane Mustard and Trevor Tite. Hillsboro’s seniors are Ethan Watson, Mason Swayne, Reece Bloomfield and Jared Thompson.